This site is dedicated the evergreen Nepali singer Narayan Gopal Gurbacharya. I will collect articles related to Narayan Gopal, songs, lyrics and music videos for his fans. 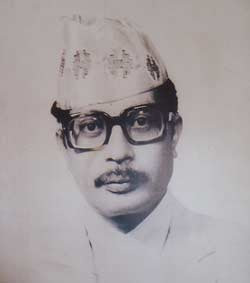 Narayan Gopal was born to a Newar family in Kathmandu, Kilagal on 18th of Ashoj1996 Bikram Sambat (BS). His father, Ashagopal Gurbacharya, was a classical musician and wanted his son to follow his footsteps. Narayan Gopal was interested in music from an early age but not exactly into classical field. He studied music in India. The late Gopal Yonjon and Narayan Gopal were good friends and "mits". (It's a nepali custom where good friends enter into a kind of a lasting friendship. This is generally seen as strengthening the friendship bond.) Narayan Gopal has sung many beautiful and soulful songs composed by Gopal Yonjon. Narayan Gopal married his long time fan from Darjeeling, Pemala Lama in Falgun 2027 BS. He has sung over 500 songs, including in films, ballets and drama. Most of his songs are melodies. It is said that he was very selective about which songs he sang.